PRINCE GEORGES COUNTY, MD – A Harnett County firefighter is in critical condition in a Washington, D.C., hospital after sustaining severe burns on call at a Maryland house fire last week. HAVELOCK – A Havelock man who accidentally set himself on fire died Tuesday morning in the hospital. ROCKY MOUNT – On February 18, 2012 at 21:06 hours, City of Rocky Mount fire units responded to a large woods fire near the 4300 block of College Road. 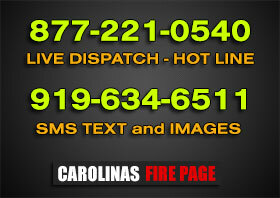 CALDWELL COUNTY – FireNews.net has been notified of a Firefighter Death. Chad Settlemyre, age 25, of the Sawmills Fire Department, Caldwell County Fire Station 40, died early Monday morning, February 27, 2012. ASHEVILLE – Firehouse Subs Public Safety Foundation is awarding much needed equipment to the Asheville Fire Department in memory of a fallen captain. WARREN COUNTY – Fire crews battled freezing temperatures, rain, sleet, and snow as they responded to a reported house fire Sunday night on Harrison Road north of Norlina and just a couple of miles from the Virginia border. Upper Hominy responded to a MVC with injuries on Davis Creek Road.